These kinds of awards go under many different names. They are not tax advantaged in any way. Companies can design them however they feel will best support the company’s business. No two plans will be the same. Once the award criteria have been fulfilled, the number of shares that have been earned will be delivered to you automatically without the participant having to pay anything for them. You won’t have to exercise your award, the company and the plan rules will determine the timing. Once the award vests, you get the shares, whatever they are worth at that time -and you don’t have to pay anything for them. The shares could have gone up in value since the award date, or they could have gone down in value- but so long as the award criteria have been satisfied, you will still get them. You will often find that the plan rules say the company has the right to sell enough shares to reimburse the employment taxes. This may take place without you really knowing about it. You would just get the after-tax number of shares delivered to you. Occasionally you may be asked if you want to pay the tax out of your own money in order to receive the maximum number of shares. Sometimes you may be asked if you want to sell more shares than are needed to cover the tax, or to sell all of your shares- in which case you just end up with cash. It will almost always be the case that in order to receive the value from your award you need to complete a period of employment with the share plan company or a company within its group. For instance, a company that wants to encourage employees to stay might grant share awards that only pay out if you complete, say, 3 years’ service. Others may decide it is better to grant awards where, instead of vesting all at once, there is a ‘vesting schedule’ that says how many of your award shares will vest after what period. For example a quarter of the award shares could vest after year 1, a quarter after year 2, a quarter after year 3 and the final quarter after year 4. 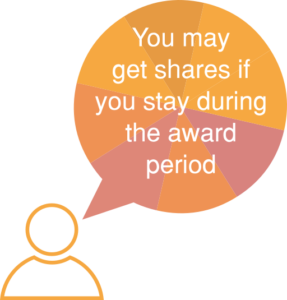 If you leave, the rules may say you lose whatever portion of your award shares have not yet vested- or there may be more generous provisions under which, for instance, individuals who are considered as ‘good leavers’ may be entitled to a proportion of their award shares. Employment conditions are almost always imposed. Increasingly, the company also imposes performance conditions so that the awards only pay out on the maturity date if the company has reached a certain level of performance. Usually the performance targets will be financial- for instance measured on the company’s earnings, or the company’s share price performance. Occasionally the targets look at other aspects- maybe improvements in customer satisfaction or in health and safety records. Sometimes there is more than one target. Awards with performance targets as well as employment conditions are likely to be granted to more senior people within the company. If the company’s shares are publicly traded, its shareholders are very likely to insist that the awards to the most senior levels are performance related. There will very likely be a ‘remuneration committee’ made up of non-executive directors, whose job it is to consider the extent to which the performance measures have been achieved, which in turn affects the extent to which the awards pay out. It is possible that at the end of the performance period, the payout could be zero. If awards are performance related and the rules allow ‘good leavers’ to retain some of their awards, the plan will either say someone has to make an estimate of the performance level early, or else that the leaver has to wait until the end of the performance period- ad see whether the awards paid out for those who continued to work in the business throughout. It is usual for leavers only to get a proportion of the number of shares that they would have got if they had stayed the whole time. The detail of the awards and the conditions that have to be satisfied to achieve a full payout might be set out in the plan rules or they might be written into the terms of the awards themselves. So how does the tax work? These awards are going to be subject to employment taxes when they vest and the shares are delivered to you. That means income tax and national insurance contributions are both due. The employer has to account for the taxes and national insurance on your behalf under Pay As You Earn. Therefore you would be left with 1000 shares less the 320 that were sold- so the company would deliver 680 shares to you. This may seem a bit odd at first, but if the employer didn’t do this it would have to reduce your take-home pay by £320 to avoid being out of pocket itself. Most employees would be in a mess if their take-home pay was reduced, because they need all of their normal take-home pay to cover their bills and living expenses. So for most people it’s much better that they can sell at least enough shares to cover the taxes. The employer (or the plan administrator) has to tell you how many shares it sold for you, how much for and how much tax and employees national insurance it has paid to HMRC on your behalf. It also has to tell HMRC what has happened. The tax system is set up so that you shouldn’t face both capital gains tax and income tax on the same amount. So, where an award is subject to tax as earnings, the shares are treated for the purposes of any capital gains tax base cost calculations as if you bought them for full market value. In this example therefore you would be treated as if you had paid £1 per share. So if you had elected to sell all your shares straight away and you got £1 per share for them, you wouldn’t have to worry about capital gains tax and you would have £680 in cash. If you kept the 680 shares and were lucky enough to be able to sell them when they were worth £2 per share, you would have made a profit of £1 on each of the shares, a total gain of £680. This might fall within your capital gains tax annual exemption– or you might have some capital gains tax to pay, depending on your circumstances at the time. You can find more information on the Tax page. You are granted a conditional share award. If the conditions are met, your shares will be delivered to you. Usually the award only vests if you remain in employment during the vesting period. There may also be other conditions that have to be satisfied before your award and vest. Employment taxes will be due on the value of the award shares. Your employer will usually have to account for the taxes under PAYE and may put in place arrangements so you can sell enough shares to cover the tax amounts you have to pay. If you need help to decide what to do with your shares, look at the Getting Advice page.